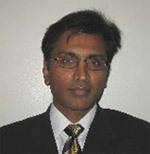 Srinath Kamineni is a Shoulder / Elbow / Upper limb specialist, both in elective, sports and trauma conditions. He was trained on the UCH / Stanmore training rotation in the UK, and then undertook a shoulder fellowship in Switzerland and an elbow fellowship in the Mayo Clinic USA. As well as NHS and Private clinical work in Shoulder, Elbow, Wrist, and Hand, he is also a Professor of Bioengineering at Brunel University (West London), conducting research concerning the shoulder and elbow.